Are there any verses which pray for the birth of daughter in Vedas? There are especial hymns and verses in Vedas which pray for the birth of a son like Atharva Veda 3.23. Be not divided; dwell ye here; reach the full time of human life. Above verses only emphasise on son over daughter. Are there any verses which pray for daughters too? It is not that the Vedas only praise the birth of a male child alone. There are instances where female progeny is also praised. Further, it is important to know that the word "putra" does not necessarily mean only male child but could mean child in general. Similarly in many places word "man" does not only indicate men but all of the mankind including men and women. So it is very obvious to a discerning person that the girl child was never disliked or unwelcome in the household. In fact special prayers and propitiations were conducted to have a girl in the family! 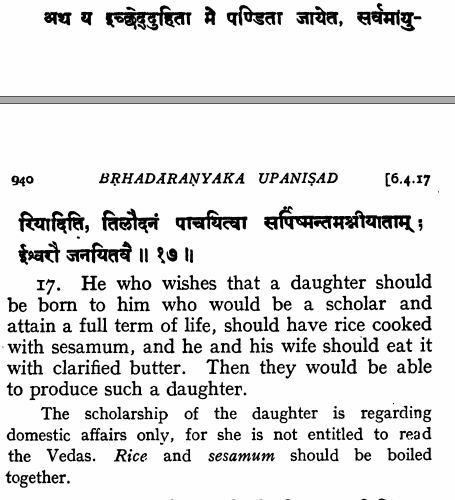 He who wishes that daughter to be born to him who would be a scholar and attain a full term of life , should have rice cooked with sesamum. Now its clear from above verses that people from Vedic period also wish a daughter child to be born to them. And this hymn shows the way to those who Want their daughters to become a scholar and live a long life . There is no instance in Rug-Veda where the birth of a girl child was considered inferior. It indicates that the position of a girl in Rig Vedic times was not considered a low. Very few number of verses regarding this matter perhaps indicative that society in need of larger number of male warriors to ensure its survival. Asvalayana Grihya Sutras (Which is a Vedanga) in AdhyayaI, Khanda 7 mentions a ritual if husband desires of female children and if he desires both male and female children. Atharva Veda 10.3.20 says it is a matter of glory to have unmarried girl (Kanya Stri). As glory dwelleth in a maid, and in this well-constructed car, So may the Charm, etc. I cook the offering, I present oblation: only my wife attends the holy service. A youthful world, a son hath been begotten. Begin a life that brings success and triumph. Clearly. the term used in past tense. It does not refer to a thing that is going to happen.So, this cannot be considered as prayer. There is no prayer for son here. With that auspicious general flow wherewith the bulls propagate their kind, Do thou obtain thyself a son: be thou a fruitful! mother-cow. Does this look like getting a male child from cow and bull?? Looks wired? Not at all. The male animal here is the spiritual insight reflecting the spiritual eye concept. This is not at all or humans. This is a metaphor. Why do some Hindu scriptures say sonless women must be abandoned? Are there famous deities/gods or spiritual supremo, who had a daughter? Are there any scriptures in Hinduism equivalent to the Vedas? Are there any Variants in Samhita of Vedas? Which verses of the Sama Veda are not taken from the Rig Veda? Are there any handshake restrictions for Hindus? Which verses for god indra in vedas mention him as friend of all human beings? Are there any temples exclusively for women? What are the rules mentioned in vedas for people? Which rig Vedic verses are repeated in atharva Veda? Are there any Gods who are girls? Are there any sudra or outcaste seers in Vedas?